This data pool (N = 617) comes from 10 independent studies assessing performance of healthy participants (i.e., no known neurological impairments) on the Iowa gambling task (IGT)—a task measuring decision making under uncertainty in an experimental context. Participants completed a computerized version of the IGT consisting of 95 – 150 trials. The data consist of the choices of each participant on each trial, and the resulting rewards and losses. The data are stored as .rdata, .csv, and .txt files, and can be reused to (1) analyze IGT performance of healthy participants; (2) create a “super control group”; or (3) facilitate model-comparison efforts. This data pool comes from eight independent published studies (3; Horstmann; 5, 6, 7; 15, 16, 17), one study under preparation (8), and one unpublished study (9). These studies report the performance of a total of 617 healthy participants on the Iowa gambling task (IGT; 1). The IGT is arguably the most popular neuropsychological paradigm to measure decision-making deficits in an experimental context. Part of the data was already reanalyzed elsewhere (i.e., 8, 10, 11, 12, 13, 14) in order to assess basic assumptions underlying the performance of healthy participants on the IGT, and to compare reinforcement-learning models that try to disentangle psychological processes underlying performance on the IGT. Table 1 describes the data pool. All included studies used (a variant of) the traditional IGT payoff scheme 1 or the payoff scheme introduced by Bechara & Damasio 2. A detailed description of the payoff schemes can be found in the Supplemental Text 1. Overview of the studies included in the data pool. See text for a description of the different payoff schemes. aInformation that was provided in the original articles. This information consists of the mean age and the standard deviation in brackets, or alternatively the occupation of the participants. In addition, the number of female participants is provided for most datasets. bData collected by Annette Horstmann. These data were first published in Steingroever et al. 10. A subset of this dataset is published in Horstmann, Villringer, and Neumann 4.
cData of the standard condition. Data of three other conditions can be downloaded here: http://www.ruudwetzels.com/data/EV_data.zip. dThe first 90 participants of this dataset are between 18–40 years old (M = 23.04, SD = 5.88), and participants 91–153 are between 61 and 88 years old (M = 76.98, SD = 5.20). In the traditional payoff scheme, the net outcome of 10 cards from the bad decks (i.e., decks A and B) is −250, and +250 in the case of the good decks (i.e., decks C and D). In addition, there are two decks with frequent losses (decks A and C), and two decks with infrequent losses (decks B and D). In the traditional payoff scheme, there is a variable loss in deck C (i.e., either −25, −50, or −75; classified here as payoff scheme 1). However, some of the included studies used a variant of this payoff scheme in which the loss in deck C was held constant (i.e., −50; classified here as payoff scheme 2). A second difference between payoff scheme 1 and 2 is that payoff scheme 1 uses a fixed sequence of rewards and losses, whereas payoff scheme 2 uses a randomly shuffled sequence. The payoff scheme introduced by Bechara & Damasio 2 (classified here as payoff scheme 3) also consists of two good decks (decks C and D), and two bad decks (decks A and B), that vary in either having frequent losses (decks A and C) or infrequent losses (decks B and D). However, in contrast to payoff schemes 1 and 2, the schedules of rewards and losses in payoff scheme 3 are structured in such a way that the discrepancy between rewards and losses in the bad decks (decks A and B) changes such that the net outcome decreases by 150 every block of 10 cards (i.e., in the first block, the net outcome is −250, but in the sixth block, it is −1000). By contrast, the net outcome of the good decks (decks C and D) increases by 25 every block of 10 cards (i.e., in the first block, the net outcome is 250, but in the sixth block, it is 375). Thus, the good decks become gradually better, whereas the bad decks become gradually worse. In addition, in contrast to payoff schemes 1 and 2, the wins differ within each deck in payoff scheme 3. Just as payoff scheme 1, payoff scheme 3 uses a fixed sequence of wins and losses. A computerized version of the Iowa gambling task was applied in all studies. The number of trials varied between 95, 100, and 150 (Table 1).1 However, the total number of trials was unknown to the participants during the experiment in all studies except for the study of Horstmann and Kjome et al. 5. After each choice, participants obtained feedback on the reward and the loss, and on the current total. Participants were instructed to choose cards to optimize their overall outcomes. Participants completed a computerized version of the IGT after having received the instructions. Participants began the task with a loan of +2000. More details on the procedures can be found in the original articles. The sample sizes presented in Table 1 might be lower than those reported in the corresponding articles due to incompletely received datasets (i.e., missing data for one participant in Kjome et al. 5, and for two participants in Wood et al. 16). Participants in the Maia & McClelland 6 study were asked about their knowledge about the decks at regular intervals during the task, something that did not occur for the other datasets. The computerized IGTs were based on one of the three payoff schemes described above (see also Table 1 and Supplemental Text 1.). To compensate participants for their participation, the studies of the data pool used two different ways of payment, that is, either monetary payment or course credit. In addition to the payment, some of the studies provided a monetary incentive depending on performance. Participants in studies without incentives (1) obtained course credits (6; 9; 15; 17); or (2) were paid a fixed amount for participation (5; 7). Participants in studies with incentives (3) were paid a fixed amount for participation and received an additional bonus depending on the overall amount won on the IGT (Horstmann); (4) were paid a fixed amount and received an additional bonus if they had accumulated the biggest overall amount won across all participants 3; or (5) could choose between options (1) and (2) – a choice that participants had to make before the start of the experiment – and received an additional bonus depending on the overall amount won on the IGT 8. All studies were administered through a computerized version of the IGT (see original articles for more details). IRB approval was obtained for each data collection (in accordance with local rules). All participants gave written informed consent before participation in the study. The shared data pool was stripped of any potentially identifying information before being uploaded. choice_95.csv, choice_100.csv, choice_150.csv, wi_95.csv, wi_100.csv, wi_150.csv, lo_95.csv, lo_100.csv, lo_150.csv, index_95.csv, index_100.csv, index_150.csv. choice_95.txt, choice_100.txt, choice_150.txt, wi_95.txt, wi_100.txt, wi_150.txt, lo_95.txt, lo_100.txt, lo_150.txt, index_95.txt, index_100.txt, index_150.txt. choice_95, choice_100, and choice_150: These matrices contain the choices of all studies that used a 95-trial, 100-trial, and 150-trial IGT, respectively. The dimension of each matrix corresponds to the number of subjects x number of trials. For example, choice_95 is a 15 x 95 matrix, and the entry of the third row and fifth column corresponds to the choice that the third participant made on the fifth trial (Fig. 1). The entries of the three choice matrices are either 1, 2, 3, or 4, where 1, 2, 3, and 4 stand for deck A, B, C, and D, respectively. wi_95, wi_100, and wi_150: These matrices contain the rewards of all studies that used a 95-trial, 100-trial, and 150-trial IGT, respectively. The dimension of each matrix corresponds to the number of subjects x number of trials. For example, wi_100 is a 504 x 100 matrix, and the entry of the third row and fifth column corresponds to the reward that the third participant received on the fifth trial. The entries of the three reward matrices vary between 40 and 170.
lo_95, lo_100, and lo_150: These matrices contain the losses of all studies that used a 95-trial, 100-trial, and 150-trial IGT, respectively. The dimension of each matrix corresponds to the number of subjects x number of trials. For example, lo_150 is a 98 x 150 matrix, and the entry of the third row and fifth column corresponds to the loss that the third participant received on the fifth trial. The entries of the three loss matrices vary between – 2500 and 0. Thus, the losses are saved as negative numbers. index_95, index_100, and index_150: These matrices contain the name of the first author of the study that reports the data of the corresponding participant. For example, the third row of index_95 can be used to identify who collected the choices saved in the third row of choice_95, wi_95, and lo_95. Screenshot of a subset of the choice_95 matrix. Each row contains the sequence of choices from a specific participant. For example, the entry of the third row and fifth column corresponds to the choice that the third participant made on the fifth trial (i.e., “2” – deck B). To determine who collected the data of this particular participant, one needs to refer to the third row of index_95 (cf. Fig. 2). Screenshot of a subset of the index_95 matrix. Each row can be used to identify who collected the data of a specific participant. 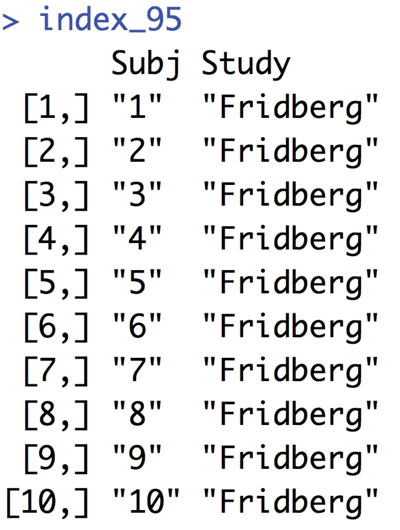 The screenshot shows that the data of subjects 1 – 10 who completed a 95-trial IGT were collected by Fridberg et al. 3. The data of these subjects are saved in the corresponding rows of the choice_95, reward_95, and loss_95 matrices. These 12 matrices all saved together in the “IGTdata.rdata” file. In addition, we saved the 12 matrices as separate .csv and.txt files. For example, the matrix choice_95 (Fig. 1) is contained in the “IGTdata.rdata” file, but also in “choice_95.csv” and “choice_95.txt”. The file names of the .csv and .txt files indicate which matrix they contain. This data pool has several reuse potentials: First, it could be used to more thoroughly investigate healthy participants’ performance on the IGT. Second, it could be reused as a “super control group”. This means that performance of an experimental group can be assessed relative to the performance of healthy participants included in this data pool. Third, the data pool could be reused to compare computational models for the IGT. However, it should be noted that the 10 datasets were collected in different environments, and that the performance of the participants on the IGT may possibly be affected by factors that varied across the included studies (e.g., the use and type of incentives, questions about the IGT during the performance to asses participants’ awareness, randomly shuffled payoff or fixed payoff sequence, the type of task instruction). 13 also used a 100-trial IGT, but they only analyzed trials 1–95 (see 3 for more details). We would like to thank Kala Battistelli, Andreas Below, Katie Chamberlain, Courtni East, Noémie J. Eichhorn, Lindsey Ferris, Monica Gamboa, Kaitlynn Goldman, Karolin Gohlke, Karla Gomez, Alexis Gregg, Jordan Hall, Christy Ho, Jonas Klinkenberg, Lauren Laserna, Katja Macher, Samantha Mallec, Megan McDermott, Ramona Menger, Gerard Moeller, Michael Pang, Anthony Schmidt, Candice Tharp, Lucas Weatherall, Michael Wesley, and Christopher Whitlow for their help in collecting the data. Steingroever, H, Šmíra, M, Lee, M D and Pachur, T (). “Do intuitive and deliberate decision makers perform differently on the Iowa gambling task?”. in preparation. Steingroever, H, Wetzels, R and Wagenmakers, E-J (2011). “Performance of healthy participants on the Iowa gambling task: The impact of an alternative payoff scheme and presentation of only net outcomes”. Unpublished raw data. Steingroever, H, Wetzels, R and Wagenmakers, E-J (). “Bayes factors for reinforcement-learning models of the Iowa gambling task”. submitted.